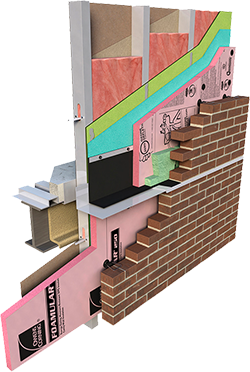 Owens Corning JointSealR Foam Joint Tape is an effective product to tape the joints of FOAMULAR® extruded polystyrene (XPS) board in vertical wall applications when it is used as continuous insulation over steel or wood wall framing, or as masonry cavity wall insulation. Provides code required weather resistance barrier when used with FOAMULAR XPS insulation. Minimizes intrution of unconditioned, moisture laden air into the wall assembly. Reliable self-adhesion coupled with strength and handleability.